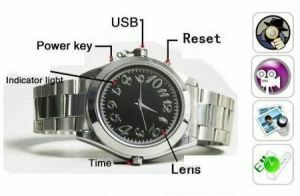 Wrist Watch but built in a smallest camera with Digital Video Recording inside the watch itself, with 4GB memory . Its a great gadget for surveillance or fun. Imagine you go out on a travel but do not take your digital camera this watch can be an best camcorder for you to take landscape and pictures of events and time that you would like to capture forever.